Network Waitangi Otautahi (NWO) supports the development of a multicultural, Treaty-based society. Because the intent and actual content of Te Tiriti o Waitangi are not well-known, let alone well-understood, we make our contribution through education to enhance understanding of the indigenous status of Tangata Whenua (people who whakapapa to a Maori ancestor) and the role everyone else as Tangata Tiriti. We focus on what was happening both globally and locally in the period leading up to the signing of the Treaty and also on the importance of its five aspects – the Preamble and four Articles. All 5 aspects of the Treaty need to be taken together as a whole and as a follow-on to the 1835 Declaration of Independence – He Wakaputanga o te Rangatiratanga o Nu Tireni. This work supports the kaupapa of the restoration of Tino Rangatiratanga by Tangata Whenua and the establishment of honourable Kawanatanga by the Crown. Through developing this understanding of the Te Tiriti o Waitangi we can assist in the process of working toward a Treaty-based, multicultural future. Currently, Te Tiriti o Waitangi is usually seen as relating almost exclusively to Maori. 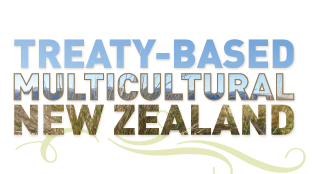 In a Treaty-based future it will be relevant to all of us, with all political relationships between Tangata Whenua and Tangata Tiriti based on it. ‘It is difficult to negotiate with those who do not share the same frame of reference’.